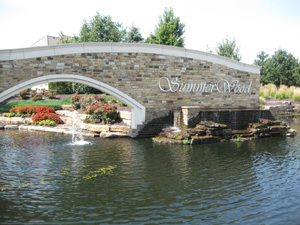 Summerwood Estates Subdivision in Overland Park KS. Home prices starting in the upper $500K' and go to the upper $700Ks. Originally platted to support Million Dollar estate homes, the real estate market turned and the area was replatted and reconfigured to a lower price point with home sale price more in the 600's to 900's. Summerwood residents are in the Blue Valley school district.